Doing a quick search of the biggest marketing companies in the world, and you’ll quickly find that consulting firms like Accenture Interactive, PwC, Deloitte Digital and IBM take up a large portion of the top 10. These aren’t what many would consider traditional marketing agencies. Yet, IBM broke the mold by cracking the top 10 list way back in 2008, and now consultancies dominate most of the top spots. This article will explore the real difference between traditional agency models and consultancies, what’s driving this shift, how is the market reacting to it? By design, a traditional marketing agency provides talented people to help their clients with marketing problems. In this instance, the client marketer believes they know what the answer to the problem is. The client has developed the strategy, the frameworks and the models to be implemented. Then the client often looks to their agency(s) to supplement (or even replace) in-house marketing functions in an outsourced manner to solve it. An agency will act on the client’s behalf, most often taking direction and project management from their clients. A marketing agency will typically work through the office of the CMO. There is a direct line here, and a good relationship into this single part of the C-suite. In contrast, the consultancy marketing model is a bit different. They are more often hired to create a solution for a problem. In this case, the client doesn’t believe they have an answer to the problem, and the consultancy is brought in to come up with the answer. This answer may include supplementing existing in-house resources, like a marketing agency. However, it also includes building strategy, frameworks, and models, using a data-driven approach, that the consultancy will implement on the client side (for a huge fee of course). In addition, the consultancy has relationships beyond the office of the CMO. They are likely looking at the bigger picture across the various lines of business. The largest consultancies have their fingers in finance, sales, operation and other parts of the business. As such, they’re dialed into a much wider cross-section of the C-suite. One more notable thing about marketing consultancies is that they’ve been evolving their model. The most successful ones have been swallowing up marketing and advertising shops to help build out their creative ability. If you net it out, historically the biggest difference is the approach each marketing company type takes. The various types of marketing agencies solve problems with people. These problems are already identified. The consultancy solves problems that the client doesn’t have an answer to (using sophisticated data approaches and time-test models), and their solution may include leveraging talent to solve it, but also includes the strategy creation and implementation components. In my humble opinion, the real rise of the marketing consultancy is due to the level of access. The buck often stops at the CMO in the agency model. Consultants have dramatic and far-reaching influence across the rest of the c-suite. This gets them far more ingrained into the business, and they are often getting to the CMO via a top-down approach through the CEO. In addition, consultancies have far-reaching access to strategic and data-driven resources that most agencies simply have not created practices around in the past. It’s a data-driven world, and even CMOs are finding themselves impressed with new levels of transparency and insight that consultants can provide. With the massive growth in the marketing consultancy world over the decade, what are agencies doing to combat this invasion on their turf? Some are doing nothing. They’re happy with their small slice of the pie. However, the behemoth agencies that have been created over time through mergers and acquisitions are under the most pressure. These huge agencies are at risk of collapsing upon themselves if their largest clients move to the consultancies of the world. As a result, what you see in the market is an adaptation. 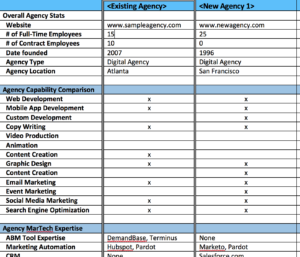 These super large traditional agencies are now building out consulting groups. They’re putting tremendous focus on creating data-driven cultures. Most importantly, they’re pivoting to give brands what they’re looking for in this new world – the strategic problem-solving part of the equation. But doing this at scale (think global) is easier said than done. Ultimately, what you see is that traditional agency model is in a tremendous amount of flux at the moment. It’s a good bet that the ones who emerge as the most successful will look a whole lot more like consulting agencies as time progresses. One thing is for sure, nothing stays the same forever.